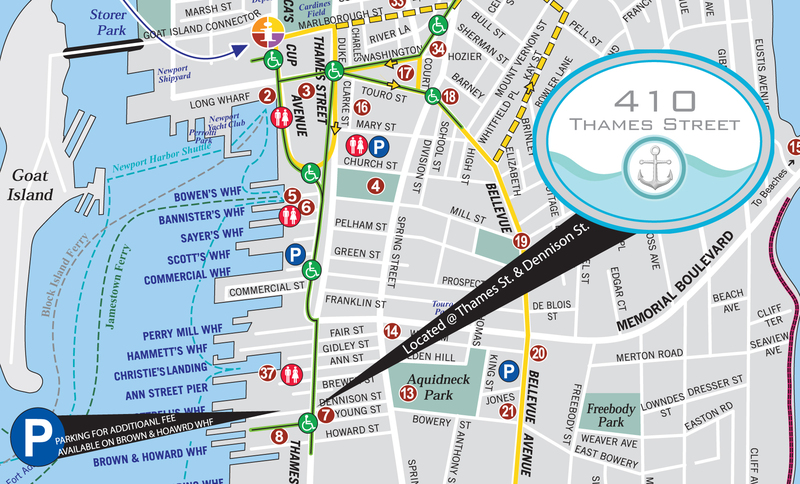 A Vacation at 410 Thames Street offers visitors a modern and elegant retreat in the heart of Newport's famous historic district. This loft offers guests exceptional capabilities for entertainment purposes. This home away from home features a gourmet kitchen accented by granite counters, stainless steel appliances and fully stocked with cookware; making it an ideal venue for entertaining family, friends and other guests while visiting the City by the Sea. Equipped with state of the art technology including flat screen TV's in all three bedrooms and the living room, along with a blue tooth accessible surround sound stereo system, this residence offers the ultimate multimedia package. Teak flooring, goose-down bedding and plush bathroom linens make up the fine details in this luxury residence. Additionally, 410 Thames Street's open floor plan with many windows allows for bright, natural light while the sweet and salty air of the ocean enters the great room through a Juliette balcony, offering sweeping views of Thames Street. Each guestroom has an en-suite full bathroom, allowing the utmost privacy for each guest. This property features two convenient parking spaces. We invite you to make yourself at home here.